"The labyrinth is an ancient spiritual tool, a metaphor for the journey of life. Walking this sacred path, in a reflective mood, enables one to ponder and evaluate where one stands in relation to God as the center of one's spiritual journey, in relation to self and to others. 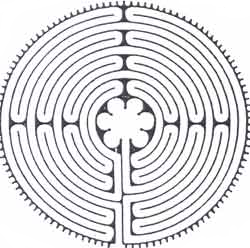 The labyrinth combines two common images, a circle and a spiral. Since the circle is a symbol of God, its center also represents and leads to God. As a spiraling path, the walk appears to be meandering, frequently representing the circuitous days and years of one's spiritual journey.